As one team in this years Rusty Nuts Rally proclaimed on the side of their sub 500 pound people carrier – “Kiss Me Hole Cancer! !” That sums up the aim of the Rusty Nuts Rally. For the second year running groups of folks from all around NI teamed up to raise some cash for a local cancer charity. Last year saw just under 15k raised for Action Cancer, with this years total already close to 16k, a fantastic result. 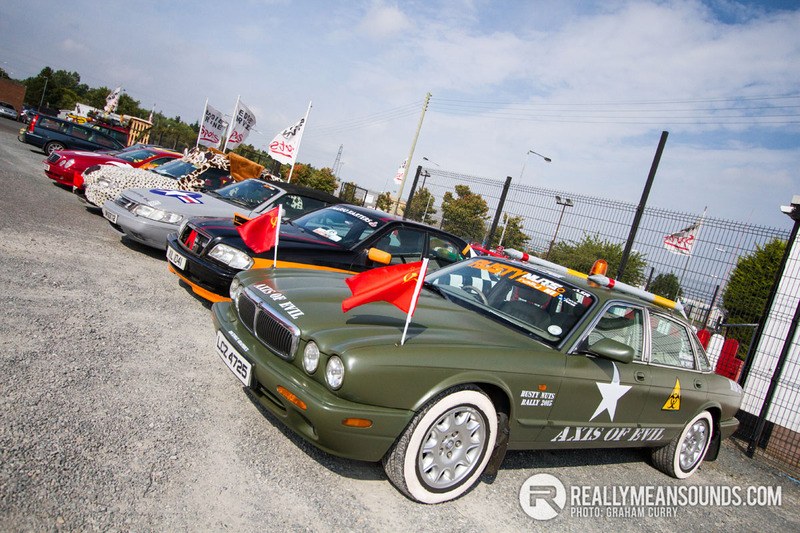 26 teams drove their modified cars around NI to raise awareness and money for the charity and had some laughs along the way. Organisers Kieran O’Neill and Hannah Rodgers (aka the Rusty Riddlers) done a superb job in herding everyone round a lap of NI finding time to organise karting at Eddie Irvines, off roading at Todds Leap and accommodation at Sheeps Island Hostel in Ballintoy and Todds Leap chalets in Ballygawley. Throw in some photo challenges and the days flew in despite the miles driven. Some cars nearly saw their end with some track time when the event wrapped up at Alltrak Rallysport in Craigavon. RNR DJs Harder Better Faster Stronger provided an open air disco at Todds Leap which was as epic as last year. It all sounds a bit like a wrecking session but you cant deny the commitment of both the organisers and the teams in achieving the goal of raising cash and awareness for Cancer Focus NI. There were plenty of RMSers involved too in a variety of machinery and it was a testament to the event that many teams returned this year for a second time. Seen these all flying past on my way home from work. Some absolute belters! I'm afraid it wasn't me. Mine went to the big highway in the sky a few months ago. Very sorry @chris_b only seeing this now, only catching up on rms today. Had no reception at all in Ballintoy on Friday evening so didn't see your post. Did you see any? Was hard to know time's as we only time we had for Saturday was leaving time and then had to be at todds leap for 4.30. But very hard to stay on time as we had challenges to do. We were in belleek at 3pm'ish then went to lough navar view point, lough erne resort and then headed for todds leap. Stopped in augher for a challenge picture as well. We were in todds leap later than the set time. Seen the big Kiss Galaxy/Alhambra/Sharan yesterday evening and then @weeloaney 's green machine on the Ballygawley line about 5.45 or so...it was the wee lad spotted it first actually...'There's that green 'Rover' from the internet', haha! He was asking what the craic was with the cars so I was tellin him all about the rally, charity etc...'So, a bit like CannonBall for poor people?' 'Close enough son!' Haha. He's got a few years to wait yet, but he's already planning our first entry. Wish I'd remembered about it on Friday evening as we could have popped round to Eddie Irvine's for a nosy! I'm sorry, OK. Let it go, you got to belleek didn't you. :p Also then I helped to find lough erne resort, and brought you to the main door. Good meeting you tho, the people taking part made the weekend, everyone was great craic. @garyo the mg was bright enough to be spotted haha. We were tame this year as we didn't know what to expect. Will be madder design next year. Nearly didn't go green tho, soo glad we did get it done tho. 2 hours sleep on Thursday night destroyed me tho haha.